My all time favorite breakfast is a carrot lox bagel, with onions and capers. So it only seemed natural to take all of those elements and turn them into an absolutely perfect cheese ball. 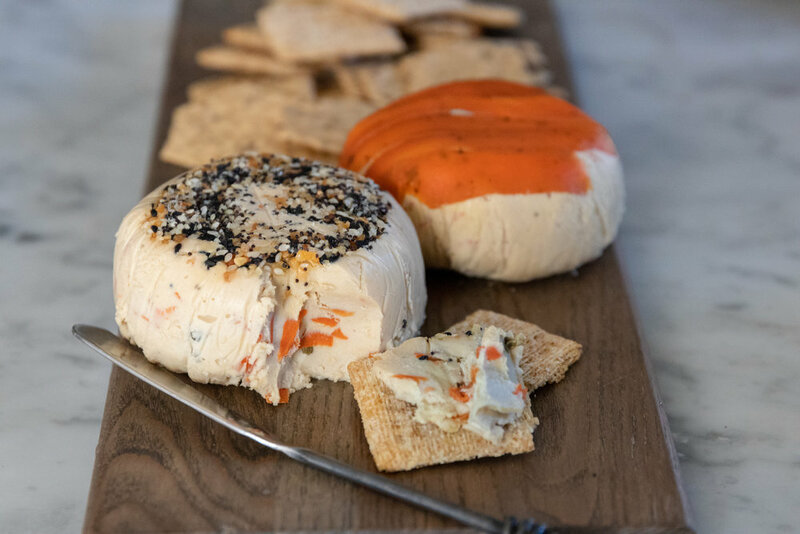 Serve this cheese ball with crackers, or veggies at a party, or smear it on a bagel for breakfast. Either way, just try not to eat the whole thing at once. Extra strips of lox, or everything bagel seasoning for garnishing the tops of the cheese balls. Now, add all of the ingredients, minus the lox and capers, to a food processor or high speed blender. Process until completely smooth. You will likely have to scrape the sides down a few times to get all the cashew bits blended. Add capers and pulse just a few times. Next, fold in the lox using a spoon. You don’t want to blend the lox. If using lox to garnish, lay 4 or 5 strips across the bottom of the plastic wrapped bowls. If use everything bagel seasoning, sprinkle about a tablespoon into the bottom of the bowl.